Spacious pub in the busy shopping street in Hammersmith. I used to visit this pub in King Street Hammersmith many years ago when I lived in the area. Given the proximity of other great pubs on the river – the Dove, the Ship etc the visits weren’t too frequent then. 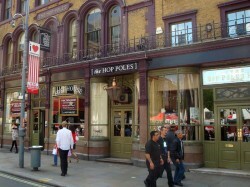 In 2010 however the Hop Poles has reinvented itself as a smart and quirky bar – check out the variety of clocks in the rear. It’s spacious with a number of distinct areas. There’s even a tiny alleyway garden out the back. Like many pubs in Hammersmith there are references to William Morris, with his distinctive designs in evidence on the walls. The pub holds Cask Marque accreditation but the Sharp’s Doom Bar I had tasted old and tired which was a disappointment. There were 5 real ales available but the selection was quite mainstream. I believe food is available but I didn’t eat.